I've been having this issue since the old launcher "force update"d me from 4.7.1 (i think, it was 4.7 early version) to 4.7.6 and I've been having an issue ever sicne and maybe before. etc. so what I'll often do is make a new blank project and add the marketplace item to that project then I'll make a folder named 'MarketPlaceItemNameX' and proceed to move all the folders into that folder which I can then migrate to my working project so that I get a nice /Game/MarketPlaceItemNameX folder with all the subfolders in it as to not dirty up my project structure. Unfortunatly more often than not this removes textures from materials, interface and event dispatcher calls, and especailly aggrivating casts (what did it originally cast to? now the cast node just says "Bad cast", gotta add it back to another new project to go find out). This became such an aggrivation that I tried out the 4.8-p3 setup, it crashed on my first attempts to even move a folder. I've tried the whole moving the files, then taking the old folders and doing the "Fix Redictors" option and it tells me its deleting the redirectors, which I do, then it works, but sometimes it doesnt and when I try to delete the "fixed" folder it gives me "Failed to load assets" and that folder is forever stuck there whether I delete it in windows explorer or in editor. I've seen many examples of this starting from the first versions of UE4 up until now. I havnt been able to find a bug report tracking # to see if its being worked on, so I'm reporting it again. I've heard that using the "Reference Viewer" option on each file, and manually creating the folder structure and then moving each file 1 by 1 and doing it using the Reference Viewer going from right to left (IE for a basic material, move the textures first, then the materal) but this is very time consuming. You would think simply moving some folders from the root directory to FolderX would be no problem (I know it isnt in Unity, but I've given up on Unity 100% since about 4.6.1). 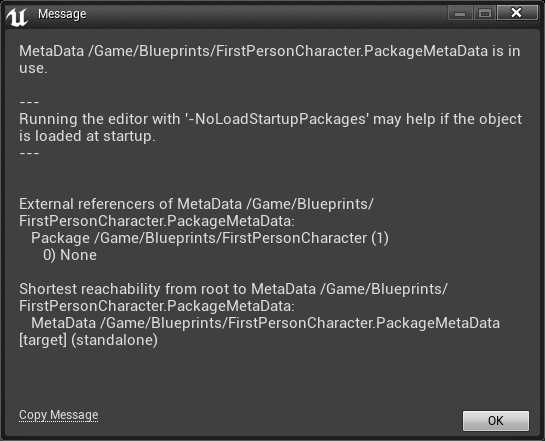 Its currently my biggest downside to UE4 and ends up causing a LOT of crashes. To TRY to replicate, make a new FPS template then move all the files within "FirstPersonBP" to the root content folder. When you try to delete the (now empty, except the redirectors) you get reference errors, so then I cancel and do a "Fix Redictors" and then accept it to delete the redirectors and then I delete the folder one more time and its gone (in the editor and Windows explorer). I do this for all the folders, of course the maps have to be moved manually. The last time I did this to replicate I created an empty level and opened it after creating the Animations, Audio, Character etc. folders in the root content folder to move /FirstPersonBP/'s content to. Next time you open the project and hit play, the crosshair is gone (in my last case) even though the HUD class is setup fine and the gamemode is setup fine. But when I reselect the texture and reselect the HUD class in the GM, everything is fine again. Not a big deal, but a HUGE deal if your dealing with a marketplace item such as ALCS which you paid 130 dollars for. Oh and then alot of the time I get this error when I try to agree to delete the redirectors after trying redirectors and then everything goes bad. Its a terrible feeling developing knowing a single file move may corrupt work and you'll have to migrate what you can and re-write what needs rewriting. Move the assets to your new folder structure in the first project. Migrate the content to the same folder structure in the new project. It sounds overall like the problem is the multiple folder structure changes. If you fix up redirectors before migrating and ensure that you are migrating the content to the same filepath in a different project (so \Unreal Projects\PROJECT1\content\folder1\ moves to \Unreal Projects\PROJECT2\content\folder1) it should work without giving you those errors. We have not heard from you in some time. I am marking this as answered for tracking purposes. If you are still experiencing this error, please comment back with the requested information. This is still happening in 4.9 in a major way. broken references, copied files, copied folders, things moved to the root and duplicated and so on. files refusing to appear in the solution. complete carnage. Did you try the steps I listed above to see if it resolved your error? This is still happening in 4.18, at very this moment. Though you move the folder, the original folder does not disappear, although it does not have any file in it. Hopefully, 3 steps of Adam Davis STAFF works. But keep in mind that, do not delete original folder structure which remains after MOVE. If you delete it (though after moving and Click 'fix up redirectors'), link can be broken. just Migrate to the new project that you prepared.